This article is about the fort in New York. For other uses, see Fort Amsterdam (disambiguation). 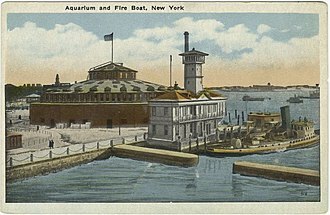 Fort Amsterdam (subsequently named Fort James, Fort Willem Hendrick, Fort James (again), Fort William Henry, Fort Anne and Fort George) was a fort on the southern tip of Manhattan. It was the administrative headquarters for the Dutch and then English/British rule of New York from 1625 or 1626, until being torn down in 1790 after the American Revolution. The fort changed hands eight times in various battles including the Battle of Long Island in the American Revolution, when volleys were exchanged between the fort and British emplacements on Governor's Island. The construction of the fort marked the official founding date of New York City as recognized by the Seal of New York City. In October 1683 what would become the first session of the New York legislature convened at the fort. Guns at the fort formed the original battery; nearby Battery Park is named for this feature. The fort's site is now occupied by the Alexander Hamilton U.S. Custom House, which houses the George Gustav Heye Center, part of the National Museum of the American Indian. Fort Amsterdam was designed by Cryn Fredericks, chief engineer of the New Netherland colony. Seventeenth-century Dutch forts all followed a similar design. Probably originally intended as a standard star-shaped fort, Fort Amsterdam had four sides with a bastion at each corner to better protect the walls. The fort was built of hard-packed earth or rubble because earthworks would absorb cannon fire without collapsing as stone walls might. Much of the construction was probably done by enslaved Africans held by the Dutch West India Company. 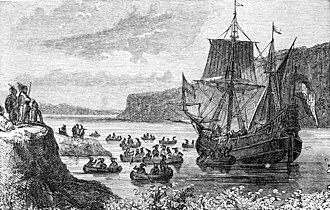 At the time, Manhattan was sparsely settled, as most of the Dutch West India Company operations were upriver along the Hudson in order to conduct trading operation for beaver pelts. According to John Romeyn Brodhead, while the fort was under construction, three Wechquaesgeek individuals traveled south from the area of present-day Westchester County to barter beaver skins. When they reached the Kolck, a pond near what is now Chinatown, they were set upon by three farmhands, and one of the two adults was killed. When the young boy who was with them grew older, he took his revenge for the murder of his uncle, which act served as a pretext for Kieft's War. The fort was the nucleus of the New Amsterdam settlement and its mission was protecting New Netherland colony operations in the Hudson River against attack from the English and the French. Although its main function was military, it also served as the center of trading activity. It contained a barracks, a church, a house for the West India Company director, and a warehouse for the storage of company goods. Troops from the fort used the triangle between the Heerestraat and what came to be known as Whitehall Street for marching drills. It is sometimes asserted that around 1620, the Dutch East India Company contacted the English architect Inigo Jones asking him to design a fortification for the harbor. Jones responded in a letter with a plan for a star-shaped fortification made of stone and lime, surrounded by a moat, and defended with cannon. Jones advised the company against constructing a timber fort out of haste. The involvement of Jones cannot be corroborated with reliable documentary evidence. In autumn 1664, four English warships with several hundred soldiers onboard arrived in New Amsterdam’s harbor and demanded the Dutch surrender. Although Peter Stuyvesant at least outwardly prepared to fight, prominent city residents persuaded him to stand down, and on September 8 he signed the colony over without any blood being shed in one of the skirmishes of the larger Second Anglo–Dutch War. The English renamed the fort Fort James, in honour of James II of England, and New Amsterdam was renamed New York in recognition of James's title as Duke of York. In August 1673, the Dutch brought in a fleet of 21 ships and recaptured Manhattan. The Dutch attack was part of the bigger Third Anglo-Dutch War. The fort was renamed Fort Willem Hendrick in honor of William III of England, who was Stadtholder and Prince of Orange, and New York was renamed New Orange. In 1674, the fort and New Orange were turned back over to the English in the Treaty of Westminster (1674) which ended the war (the Dutch got Suriname). The English once again named the area "New York" and returned the Fort James name. During this period, Thomas Dongan, 2nd Earl of Limerick, who was the royal governor of New York, convened the first legislature of New York in October 1683 for a meeting at the fort. Dongan was also the first to establish batteries of cannon to the south of the fort. In 1689, following the Glorious Revolution (English Revolution of 1688), in which William and Mary acceded to the throne, German-born colonist Jacob Leisler seized the fort in what was called Leisler's Rebellion. He represented the common people against a group of wealthy leaders represented by Pieter Stuyvesant and others and enacted a government of direct popular representation. By some accounts, he also acted to redistribute wealth to the poor. Leisler's rule ended in 1691, when British sovereign William's new governor (appointed in 1690) finally reached New York. The fort had earlier been named for Willem when he was head of the Dutch government. He became the sovereign of the English government by the overthrow of James in the Glorious Revolution. The fort was renamed Fort William Henry in honor of the new Protestant king. The fort continued to be named for subsequent British sovereigns: Fort Anne (for Anne, Queen of Great Britain) and Fort George for the succession of Georgean monarchs (George I of Great Britain, George II of Great Britain, George III of the United Kingdom). 92 guns were added to the battery in 1756 during the French and Indian War, the North American front of the Seven Years' War. The fort became the target of American rioting following Parliament's passage of the Stamp Act 1765. Activists spiked the guns at the battery to make them inoperable. In the American Revolution, the colonists under George Washington seized the fort in 1775, before the colonies formally seceded from the British Empire. During the Battle of Long Island, guns from the fort engaged British frigates starting on July 12, 1776. Between September 2 and 14, the fort and British guns on Governors Island exchanged volleys. The British recaptured the fort along with lower Manhattan in September 1776. They occupied the city and ruled New York from the fort throughout the war. Thousands of slaves migrated to the British lines in New York to gain promised freedom by fighting with them during the war. A large camp of freedmen was set up nearby. Afterward, the British evacuated more than 3,000 former slaves from New York to Nova Scotia, to fulfill their promise. Others were taken to the Caribbean and some to London. Many found the climate harsh in Nova Scotia, and supplies late and limited. They struggled to settle there, also having to deal with slaveholding Loyalists. More than 1,700 former African Americans emigrated to Freetown, Sierra Leone in 1792, after Britain set up a new colony in West Africa for free blacks and liberated slaves. The Americans took over the fort in Manhattan on Evacuation Day, November 25, 1783, after the British pulled out. In 1788, the government ordered the razing of Fort George (as it was then known). Its materials were used as landfill to add to the shore and expand the Battery. The fort was torn down in 1790, and the Government House, intended as the presidential residence, was built on the site. The need for new fortifications soon became apparent, especially as tensions started rising again with France and Great Britain. In 1798, guns were placed in temporary fortifications on the Battery. Eventually a new fort, Castle Clinton, was built on Lower Manhattan to the southwest, shortly before the outbreak of the War of 1812 with Britain. 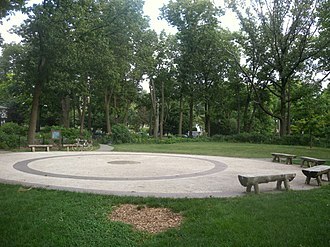 The site of Fort James was redeveloped for the Alexander Hamilton U.S. Custom House. Prior to landfilling and the creation of Battery Park, it was located at the shoreline of the Hudson River but is now a few blocks away. ^ "History of Slavery in New York". Slavery in New York. ^ Davis, Asahel (1854). History of New Amsterdam. New York: R. T. Young. ^ "Fort Amsterdam". New Netherland Institute. ^ Brodhead, John Romeyn (1853). History of the State of New York. New York: Harper & Brothers. ^ National Parks of New York Harbor Conservancy. The New Amsterdam Trail (PDF). ^ Hemstreet, Charles (1905). Nooks and Corners of Old New York. New York: Charles Scribner's Sons. ^ Carleton, Guy Lee; Thorpe, Francis Newton (1904). "The Dutch Under English Rule". The History of North America. New York: G. Barrie & sons. p. 167. ^ "Fort George". dmna.ny.gov. February 19, 2006. Retrieved July 23, 2013. ^ "The Battery". New York City Department of Parks and Recreation. ^ "Historic Timeline of The Battery". The Battery Conservancy. 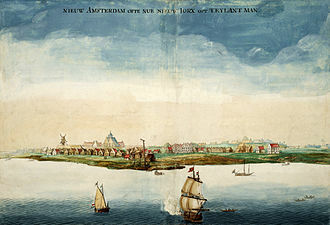 Wikimedia Commons has media related to Fort Amsterdam. "George Washington's New York: Virtual tour". nyharborparks.org. New Netherland, or Nieuw-Nederland in Dutch, was the 17th century colonial province of the Republic of the Seven United Netherlands on northeastern coast of North America. The claimed territory were the lands from the Delmarva Peninsula to southern Cape Cod, settled areas are now part of Mid-Atlantic states of New York, New Jersey, with small out posts in Connecticut, and Pennsylvania. 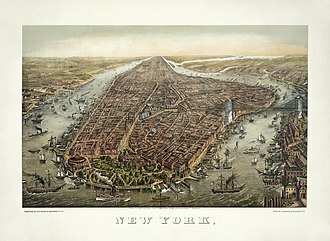 Its capital, New Amsterdam, was located at the tip of the island of Manhattan on the Upper New York Bay. Initially explored in 1609 by Henry Hudson, sailing on an expedition for the Dutch East India Company, the region was surveyed and charted. International law required not only discovery and charting but settlement to perfect a territorial claim, large scale settlement was rejected in favor of formula that was working in Asia, namely establishing factorijen. Mismanagement and underfunding by the Dutch West India Company, and misunderstandings, liberalization of trade, a degree of self-rule, and the loss of Dutch Brazil led to exponential growth in the 1650s. Transfers of power from the Netherlands to England, the last formalized in 1674, were peaceful in the province. During the first decade the first of two Fort Nassaus was built in Mahican territory, and factorijen, or small trading post went up, trapper Jan Rodrigues is believed to be the first recorded non-Native American to winter on the island of Manhattan in 1611. Initially the South River, believed to have better climate, was chosen as site of the capital, but summer humidity and mosquitos, and winter freezing, made North River, more appealing. Small groups of the arrivals were dispersed upstream to Fort Orange, to the south Fort Wilhelmus, or to Kievets Hoek. Among those who made the crossing were many Walloons and 11 Africans, in 1629, the company introduced inducements known as the Charter of Freedoms and Exemptions, commonly known as the patroon system. A number of attempts were made, the one of substantial success being the Manor of Rensselaerswyck. 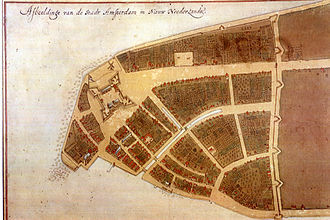 Pavonia, across the river from New Amsterdam, was returned to WIC, in 1640 company policy was changed and allowed land purchases by individuals in good standing. Flatlands is a neighborhood in the southeast part of the borough of Brooklyn in New York City. The area is part of Brooklyn Community Board 18, originally an independent town, Flatlands became part of the City of Brooklyn in 1896. The neighborhood borders are defined by Avenue H to the north, Avenue U to the south, Ralph Avenue to the east, Flatbush Avenue to the southwest. Crops typically grown in the area were beans, marsh hay, potato bean and clams were farmed and harvested from Jamaica Bay, surrounding marshes and basins. Historic homes dated to the 18th century include the Stoothoff-Baxter-Kouwenhaven House, other historic structures are the Hendrick I. Lott House, which was a stop on the Underground Railroad, the town’s growth and development came late because of a lack of a transit system or set of roads connecting it with other parts of Brooklyn. The Junction, at Flatbush Avenue and Nostrand Avenue replaced the center. Flatlands was annexed by the city of Brooklyn in 1896, based on data from the 2010 United States Census, the population of Flatlands was 64,762, a decrease of 1,964 from the 66,726 counted in 2000. Covering an area of 1,249.32 acres, the neighborhood had a density of 51.8 inhabitants per acre. The racial makeup of the neighborhood was 18. 2% White,66. 3% African American,0. 2% Native American,4. 0% Asian,0. 0% Pacific Islander,0. 5% from other races, and 1. 8% from two or more races. Hispanic or Latino of any race were 8. 9% of the population, household income is $75,949, almost $13,000 higher than the average total income for Brooklyn. The main shopping streets in Flatlands are Utica Avenue, Flatbush Avenue, Avenue N, residents commonly shop at the nearby indoor mall, Kings Plaza, located by the borders of Flatlands and Marine Park, while being across the water to Mill Basin. No New York City Subway service runs into Flatlands and express buses are used as a means of travel in and around the area. As of June 2013, the buses that serve Flatlands are the B2, B3, B6, B7, B9, B41, B44, B44 SBS, B46, B47, B82, B100, B103, BM1, BM2, Q35. Roy DeMeo, Gambino Crime Family member Chris Mullin, former NBA basketball player, was born, notes Further reading New York Times article on Flatlands History of Flatlands including early Dutch settlers Manbeck, John B. The Battle of Long Island is known as the Battle of Brooklyn and the Battle of Brooklyn Heights. 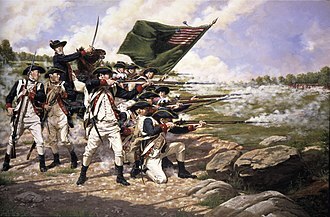 It was fought on August 27,1776 and was the first major battle of the American Revolutionary War to take place after the United States declared its independence on July 4,1776. It was a victory for the British Army and the beginning of a campaign that gave them control of the strategically important city of New York. In terms of troop deployment and fighting, it was the largest battle of the entire war, Washington understood that the citys harbor would provide an excellent base for the British Navy during the campaign, so he established defenses there and waited for the British to attack. After five days of waiting, the British attacked American defenses on the Guan Heights, unknown to the Americans, Howe had brought his main army around their rear and attacked their flank soon after. The Americans panicked, resulting in twenty percent losses through casualties and captures, the remainder of the army retreated to the main defenses on Brooklyn Heights. The British dug in for a siege but, on the night of August 29–30, Washington and the Continental Army were driven out of New York entirely after several more defeats and forced to retreat through New Jersey and into Pennsylvania. In the first stage of the war, the British Army was trapped in the city of Boston and they abandoned it on March 17, setting sail to Halifax. Washington began to transfer regiments to New York City which he believed the British would next attack because of its strategic importance. Washington left Boston on April 4, arrived at New York on April 13, Washington had sent his second in command Charles Lee ahead to New York the previous February to establish the citys defenses. Lee remained in New York City until March, when the Continental Congress sent him to South Carolina, troops were in limited supply, so Washington found the defenses incomplete, but Lee had concluded that it would be impossible to hold the city with the British commanding the sea. He reasoned that the defenses should be located with the ability to inflict casualties upon the British if any move was made to take. York was founded by the Romans in 70 AD. Upon the arms / shield, the four windmill sails recall the citys Dutch history as New Amsterdam, the flour barrels and windmills represent the tremendous wealth generated by New York City from the Bolting Act of 1674. The act gave the city a monopoly to mill and export flour. The shield and supporters rest upon a laurel branch. The crest over the seal is the eagle, added in 1784. Prior to this change, a crown had been located in this space, the eagle rests upon a hemisphere. At the bottom is the date,1625, when Fort Amsterdam was designated the capital of the province of New Amsterdam, the first Dutch settlers actually arrived in the region in 1624, and the town of New Amsterdam was incorporated in 1653. The English came in 1664 and the Dutch Governor Stuyvesant surrendered signing the English documents on September 8,1664, a laurel wreath encircles the seal. The city clerk is the custodian of the City Seal, for this reason the New York Arts Commission formed a blue-ribbon committee to create a new seal and flag. Greenwich /ˈɡrɛnᵻtʃ/ is a town in Fairfield County, United States. As of the 2010 census, the town had a population of 61,171. The largest town on Connecticuts Gold Coast, it is home to many hedge funds, Greenwich is the southernmost and westernmost municipality in Connecticut as well as the six-state region of New England. It takes roughly 40-50 minutes by train from Grand Central Terminal in Manhattan, cNN/Money and Money magazine ranked Greenwich first on its list of the 100 Best Places to Live in the United States in 2005. The town is named after Greenwich, a borough of London in the United Kingdom, the town of Greenwich was settled in 1640. One of the founders was Elizabeth Fones Winthrop, daughter-in-law of John Winthrop, Greenwich was declared a township by the General Assembly in Hartford on May 11,1665. During the American Revolution, General Israel Putnam made an escape from the British on February 26,1779. Although British forces pillaged the town, Putnam was able to warn Stamford, p1270020-300x225. jpg | Putnam Hill, where General Putnam escaped. In 1974, Gullivers Restaurant and Bar, on the border of Greenwich and Port Chester, in 1983, the Mianus River Bridge, which carries traffic on Interstate 95 over an estuary, resulting in the death of three people. For many years, Greenwich Point, was only to town residents. However, a lawyer sued, saying his rights to freedom of assembly were threatened because he was not allowed to go there, the lower courts disagreed, but the Supreme Court of Connecticut agreed, and Greenwich was forced to amend its beach access policy to all four beaches. According to the United States Census Bureau, the town has an area of 67.2 square miles, of which 47.8 square miles is land and 19.4 square miles. In terms of area, Greenwich is twice the size of Manhattan. The town is bordered to the west and north by Westchester County, New York, to the east by the city of Stamford, and faces the Village of Bayville to the south across the Long Island Sound. The Census Bureau recognizes seven CDPs within the town, Cos Cob, Old Greenwich, Riverside, the USPS lists separate zip codes for Greenwich, Cos Cob, Old Greenwich, and Riverside. Midwood is a neighborhood in the south-central part of the New York City borough of Brooklyn. It is bounded on the north by the Bay Ridge Branch tracks just above Avenue I and Brooklyn College campus of the City University of New York, and on the south by Avenue P and Kings Highway. The eastern border is Nostrand Avenue, Flatbush Avenue, or Coney Island Avenue, the name, derives from the Middle Dutch word, the name the settlers of New Netherland called the area of dense woodland midway between the towns of Boswyck and Breuckelen. Through Swartwouts suggestion, the settlement was named the village of Midwout or Midwolde, in April 1655, Stuyvesant and the Council of New Netherland appointed Swartwout a schepen, to serve with Snedeker and Adriaen Hegeman as the Court of Midwout. Later, it part of old Flatbush, situated between the towns of Gravesend and Flatlands. It became more developed in the 1920s when large middle class housing tracts, many Midwood residents moved to the suburbs in the 1970s, and the neighborhood and its commercial districts declined. Drawn by its quiet middle-class ambiance, new residents began pouring into Midwood during the 1980s, the usage of Flatbush to mean Midwood dates to the period when the neighborhood was first formed, and known as South Greenfield. This usage is common among Orthodox Jews. Many consider the neighborhood of Fiske Terrace/Midwood Gardens to be part of Midwood. The main shopping streets in the area are Kings Highway, Avenue J, Avenue M, Flatbush Avenue, Nostrand Avenue, and Coney Island Avenue. In the 1950s, 1960s, and 1970s, Kings Highway had Dubrows Cafeteria, a cafeteria where holes would be punched in patrons printed tickets. It was a place to eat and socialize. In his run for the White House, Democratic presidential candidate John F. Kennedy held a campaign rally just outside Dubrows Cafeteria. A huge crowd of people turned out to hear this popular political icon speak, years later, his brother Senator Robert F. Kennedy held a similar campaign rally there for his run for President, with a similarly large audience. The term is used in a naval context to describe groups of guns on warships. Historically the term referred to a cluster of cannon in action as a group. Such batteries could be a mixture of cannon, howitzer, or mortar types, a siege could involve many batteries at different sites around the besieged place. The term came to be used for a group of cannon in a fixed fortification and they were usually organised with between six and 12 ordnance pieces, often including cannon and howitzers. By the late 19th century battery had become standard mostly replacing company or troop, in the 20th century the term was generally used for the company level sub-unit of an artillery branch including field, air-defence, anti-tank and position. 20th-century firing batteries have been equipped with mortars, howitzers, during the Napoleonic Wars some armies started grouping their batteries into larger administrative and field units. Groups of batteries combined for field combat employment called Grand Batteries by Napoleon, administratively batteries were usually grouped in battalions, regiments or squadrons and these developed into tactical organisations. These were further grouped into regiments, simply group or brigades, to further concentrate fire of individual batteries, from World War I they were grouped into artillery divisions in a few armies. Coastal artillery sometimes had completely different organizational terms based on shore defence sector areas, the rank of a battery commander has varied, but is usually a lieutenant, captain, or major. The number of guns, mortars or launchers in a battery has varied. In the 19th century four to 12 guns was usual as the number to maneuver into the gun line. By late 19th century the artillery battery was divided into a gun line. The gun line consisted of six guns and 12 ammunition mules, during the American Civil War, artillery batteries often consisted of six field pieces for the Union Army and four for the Confederate States Army, although this varied. Batteries were divided into sections of two guns apiece, each section normally under the command of a lieutenant, the full battery was typically commanded by a captain. The British responded by imposing punitive laws on Massachusetts in 1774 known as the Coercive Acts, following which Patriots in the other colonies rallied behind Massachusetts. Tensions escalated to the outbreak of fighting between Patriot militia and British regulars at Lexington and Concord in April 1775, the conflict developed into a global war, during which the Patriots fought the British and Loyalists in what became known as the American Revolutionary War. The Continental Congress determined King George IIIs rule to be tyrannical and infringing the rights as Englishmen. The Patriot leadership professed the political philosophies of liberalism and republicanism to reject monarchy and aristocracy, Congress rejected British proposals requiring allegiance to the monarchy and abandonment of independence. The British were forced out of Boston in 1776, but captured and they blockaded the ports and captured other cities for brief periods, but failed to defeat Washingtons forces. After a failed Patriot invasion of Canada, a British army was captured at the Battle of Saratoga in late 1777, a combined American–French force captured a second British army at Yorktown in 1781, effectively ending the war in the United States. The Treaty of Paris in 1783 formally ended the conflict, confirming the new nations complete separation from the British Empire. The United States took possession of all the territory east of the Mississippi River and south of the Great Lakes, with the British retaining control of Canada. 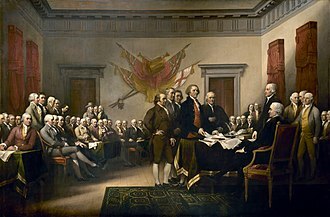 Among the significant results of the revolution was the creation of a new Constitution of the United States. Historians typically begin their histories of the American Revolution with the British victory in the French and Indian War in 1763, the lands west of Quebec and west of a line running along the crest of the Allegheny mountains became Indian territory, temporarily barred to settlement. For the prior history, see Thirteen Colonies, in 1764, Parliament passed the Currency Act to restrain the use of paper money which British merchants saw as a means to evade debt payments. Parliament passed the Sugar Act, imposing customs duties on a number of articles, none did and Parliament passed the Stamp Act in March 1765 which imposed direct taxes on the colonies for the first time. All official documents, newspapers and pamphlets—even decks of playing cards—were required to have the stamps, the colonists did not object that the taxes were high, but because they had no representation in the Parliament. Benjamin Franklin testified in Parliament in 1766 that Americans already contributed heavily to the defense of the Empire, stationing a standing army in Great Britain during peacetime was politically unacceptable. London had to deal with 1,500 politically well-connected British officers who became redundant, in 1765, the Sons of Liberty formed. They used public demonstrations, boycott and threats of violence to ensure that the British tax laws were unenforceable, in Boston, the Sons of Liberty burned the records of the vice admiralty court and looted the home of chief justice Thomas Hutchinson. Several legislatures called for united action, and nine colonies sent delegates to the Stamp Act Congress in New York City in October 1765, moderates led by John Dickinson drew up a Declaration of Rights and Grievances stating that taxes passed without representation violated their rights as Englishmen. It is part of the borough of Manhattan in New York City. The National Park Service administers a portion of the north of the island as the Governors Island National Monument. The island is accessed by ferries from Brooklyn and Manhattan, the islands current name, made official in 1784, stems from the British colonial era, when the colonial assembly reserved the island for the exclusive use of New Yorks royal governors. In 1776, during the American Revolutionary War, Continental Army troops raised defensive works on the island, from 1783 to 1966, the island was a United States Army post, and from 1966 to 1996 the island served as a major United States Coast Guard installation. About 103 acres of fill was added to the island by 1912, in 1524, Giovanni da Verrazzano saw the island, becoming the first European to do so. It was called Paggank by the Native Americans, in May 1624, Noten Eylandt was the landing place of the first settlers in New Netherland. In 1633, the director of New Netherland, Wouter van Twiller. Later he operated a farm on the island, New Netherland was conditionally ceded to the English in 1664, and the English renamed the settlement New York in June 1665. By 1674, the British had total control of the island. The harbor defenses on the continued to be improved over the summer. 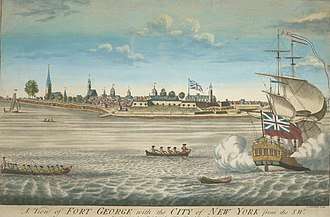 The Continental Army forces collapsed after being flanked and eventually withdrew from Brooklyn and from Governors Island as well, from September 2 to 14, the new British garrison would engage volleys with Washingtons guns on the battery in front of Fort George in Manhattan. The fort, along with the rest of New York City, was held by the British for the rest of the war until Evacuation Day at the end of the war in 1783. At the end of the Revolution, the island, as a holding of the Crown, came into ownership by the state of New York. Noten Island was renamed Governors Island in 1784 as the island, the Governors House survives as the oldest structure on the island. By the late 1790s, the Quasi-War with France prompted a national program of harbor fortifications and the state of New York began improvements as a credit for its Revolutionary War debt. Custom House is a building in New York City built in 1902–07 by the federal government, to house the duty collection operations for the Port of New York. 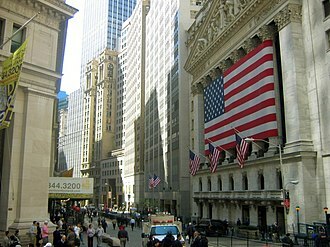 It is located at 1 Bowling Green, near the tip of Manhattan, roughly on the same spot as Fort Amsterdam. The building was designed by Minnesotan Cass Gilbert, who designed the Woolworth Building. The selection of Gilbert to design the building was marked with controversy, until 1893, federal office buildings were designed by government architects under the Office of the Supervising Architect of the United States Department of the Treasury. In 1893, the Tarsney Act permitted the Supervising Architect to hire private architects following a competition, the Supervising Architect James Knox Taylor picked Gilbert, who earlier had been his partner at the Gilbert & Taylor architecture firm in St. Paul, Minnesota. The scandal never quite blew over, and in 1913, the Tarsney Act was repealed, constructed between 1902 and 1907, the building is considered to be a masterpiece of the Beaux-Arts style, where public transactions were conducted under a noble Roman dome. 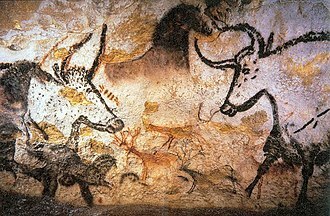 It incorporates Beaux Arts and City Beautiful movement planning principles, combining architecture, sculpture was so crucial to the scheme that the figure groups had independent contracts. The major work across the front steps, The Continents, called the Four Continents, of Asia, Europe, above the main cornice are standing sculptures representing the great seafaring nations, representing American seagoing commerce as the modern heir of the Phoenicians. In 1937, during the Great Depression, the Treasury Relief Art Project commissioned a cycle of murals for the rotunda from Reginald Marsh. The building sits on the site of Fort Amsterdam, the fortification constructed by the Dutch West India Company to defend their operations in the Hudson Valley, the fort became the nucleus of the New Amsterdam settlement, and in turn, of New York City. From 1799 to 1815, the first Custom House at this site was the Government House, the building is on the National Register of Historic Places, for both its exterior and public interior spaces. Zwaanendael or Swaanendael /ˈzwɑːnəndɛl/ was a short lived Dutch colonial settlement in Delaware. The name is archaic Dutch for swan dale, the site of the settlement became the town of Lewes, Delaware. This was in 1629, three years before the charter of Maryland, and is the oldest deed for land in Delaware and its water-front nearly coincides with the coast of Kent and Sussex Counties. The purchase was ratified in 1630 by Peter Minuit and his council at Fort Amsterdam. 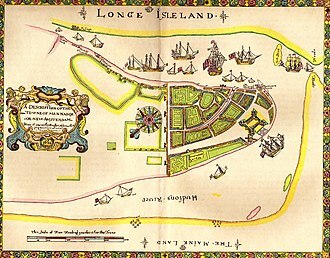 The estate was extended, on May 5,1630, by the purchase of a tract twelve miles square on the coast of Cape May opposite. A company was formed to colonize the tract that included Blommaert, Kiliaen van Rensselaer, Joannes de Laet, David Pietersen de Vries and Mathijs Jansen Van Keulen. A ship of eighteen guns, The Walvis was fitted out to bring over the colonists and subsequently defend the coast, a colony of twenty-eight people was planted on Blommaerts Kill, a little north of Cape Henlopen, and its governorship was entrusted to Gillis Hosset. A palisaded fort was built, with the red lion, rampant, of Holland affixed to its gate, and the country was named Swaanendael or Zwaanendael Colony, while the water was called Godyns Bay. The existence of the colony was short, for the Indians came down upon it in revenge for an arbitrary act on the part of Hosset. One of their chiefs took this off, for the purpose of making tobacco-pipes and they went away, and the friends of the murdered chief incited their friends, as they are a people like the Indians, who are very revengeful, to set about the work of vengeance. They relieved the sick man of life, and shot into the dog, who was chained fast, and they proceeded towards the rest of the men, who were at work, going amongst them with pretensions of friendship, struck them down. 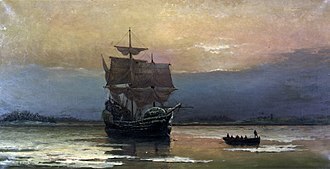 Thus was our young colony destroyed, causing us serious loss, arriving December 5,1632 at the charred remains of the settlement, de Vries negotiated a treaty with the Indians and sailed up the Delaware River, attempting to trade for beans and corn. French Napoleonic artillery battery. Photo taken during the 200th anniversary reenactment of the battle of Austerlitz which took place in 1805.